Did truck consumption go down in the last two decades or did it not change? Associations and the EU are disputing this with the vehicle manufacturers. 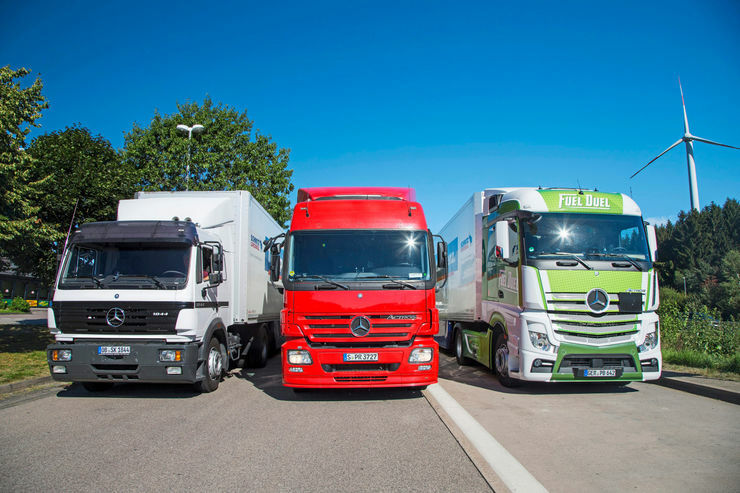 A test with three Mercedes trucks from three generations could settle the dispute. A graph makes an international career. It shows the test consumption of heavy trucks from 1966 up to today. All numbers in this graph come from lastauto omnibus and they are simultaneously the only publicly accessible and widely comparable numbers on the topic of consumption over such a long time frame. 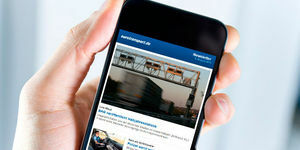 The EU likes using the numbers to show that the truck manufacturers have only done a little in the past 20 years for consumption; the US International Council on Clean Transportation, which was also decisively involved in uncovering the diesel scandal at VW, quotes the same figures and argues similarly to the EU. The vehicle manufacturers naturally interpret the graph completely differently and want to use the same figures to prove that, when it comes to consumption, a lot has been done. The graph actually shows the consumption, but also the average speed as a mean value of every year. More than 50 I/100 km and barely more than 50 km/h average speed on the then 750-kilometer-long test route were the rule at the end of the 1960s. With direct injection and turbocharging (later additionally intercoolers), but also with aerodynamic helpers like the roof spoiler, the consumption went down almost continuously for 20 years and sank to 35 I/100 km; the speed rose from 65 to over 70 km/h. And then came the emission regulations. With Euro 1, almost all manufacturers (exception: Volvo) made a somewhat lazy compromise and retarded the injection timing by several crankshaft angle degrees. That brought reduced combustion temperatures and less NOx at the same time, but up to 10 percent more consumption at full load. 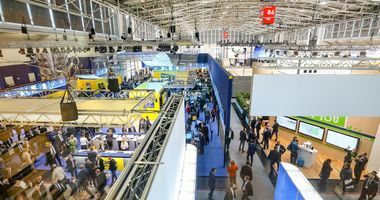 The consumption sank slightly again despite Euro 2 and Euro 3 in the following years, with help from partially or fully electronic injection systems. Euro 4 and Euro 5 brought cleaner emissions again thanks to SCR, but no prominent consumption improvements. With ill will, an improvement of consumption is hardly indicated in the time frame of Euro 1 to Euro 5. With good will, a sharp eye discovers a slight decrease in consumption in the graph with significantly increased transport speed and – what the graph mostly shows only as a footnote – a drastically reduced pollutant concentration in the exhaust. The consumption went down decisively again only with the introduction of Euro 6, even though the truck manufacturers had feared the opposite. But we'll come back to this later. What has really been done with consumption in these 15 to 20 years since the introduction of Euro 1? -lastauto -omnibus investigated this question with three semi-trailer tractors from three generations and with about the same power. The same power plays an important role with such a comparison, because it results in similar driving performances (i.e. transport speeds). The consumption values in the graph generally correspond with increasing transport speeds, however, because truck power has continued to rise over the years – at a rate of 50 hp per decade. In short: The higher speed cancels out part of the consumption improvements achieved in the engine. And something else also skews the statistics a little bit: In the year 1996, when the 1844 participated in this test as one of the last Mercedes SKs to roll off the production line, tractors like the 370 MAN or the 35 and 38 series Benz dominated the landscape of the street. The average consumption value of the year is therefore based predominantly on test values from trucks with significantly less power. And it is based on only 3.8 meters of overall height, which was previously the norm in the test and in practice. 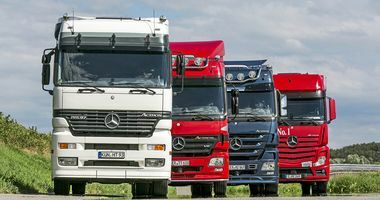 The same goes for the participating Actros 1846, which, with its 456 hp, stood out from the masses that were on the road with 400 to 420 hp at the time. The new Actros 1845, on the other hand, exactly meets the current buying standards. 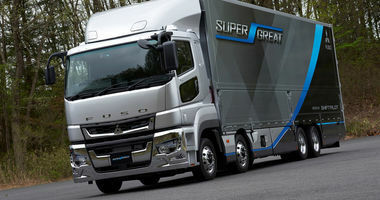 A value of 450 hp is currently one of the most common engine ratings in long-distance transport with a permitted gross vehicle weight of 40 tons. Although high power does not fundamentally entail more consumption, practice and test results from all those years show that power has an influence on consumption when it is used. For example, driving uphill results in a higher momentary consumption with strong trucks (measured in I/100 km). However, due to the higher speed, this consumption occurs over a shorter time than with a weaker truck, which largely compensates for the higher momentary consumption. The consumption is nevertheless higher, because rolling resistance and air resistance grow with a higher speed. The engine efficiency plays a complicated role with a partial load. Here, a strong engine runs under less load than a weaker engine does. It can be said that the smaller the load, the more expensive (in g/kWh) it becomes to produce every hp (or kW). It is theoretically possible to drive a stronger tractor like a weaker one, but no driver does this and it is also unrealistic. The driver has no influence on consumption with a constant speed of 85 anyway, and he will floor the pedal on hills. To drive at half throttle here would be nonsense for various reasons. So there's no getting around the same power, if consumptions are to be compared over a time frame of 20 years. However, the same power does not mean the same technology with this test. Because here, the SK1844, Actros 1846 and 1845 differ more than the same approximate power would indicate. The SK 1844 competes in the test with a large (14.6 liters displacement) V8 engine with fairly mild charging, low combustion pressure, overdrive gearbox coupled with electropneumatic shifting (EPS) and a planetary hub reduction axle. The injection corresponds to the state-of-the-art: A Bosch control sleeve injection pump (in-line injection pump with electronic diesel regulation) sends the fuel at a leisurely 1,250 bar into the eight cylinders. Although this OM442LA in the Euro 2 version delivers a full 200 Nm more than previously, a large part of the power still disappears in the overdrive gearbox and the axle drive. Despite this, it still moves quickly over the test route – also compared to current standards. This is also due to the relatively low axle ratio. On hills, it is frequently convenient that the much used seventh (and highest) gear is also the direct gear. The result: One shift (of the 16-speed gearbox) from cruising speed to 1,700 or 1,800 rpm, and the good-old SK marches quickly up the inclines, firmly digs in at 1,400 rpm and still pulls very well at 1,100 rpm if it must. It requires, of course, a lot of attention from the driver if consumption and speed are to be correct. After almost 2,000 kilometers, the figures are set: 40.81 I/100 km and 83.71 km/h for the average speed. Compared to the SK 1844, the Actros 1846 appears rather modern. The new V6 four-valve engine in the Actros, called the OM501LA, makes do with with twelve liters of displacement, fulfills Euro 3 and works with electronically controlled individual pumps and up to 1,800 bar injection pressure. The overdrive gearbox has long since given way to a direct-gear gearbox, and the planetary hub reduction axle has been replaced with a single-reduction hypoid axle. Despite having a smaller displacement than the older V8, the new V6 still delivers more torque (2,200 as opposed to 2,100 Nm). 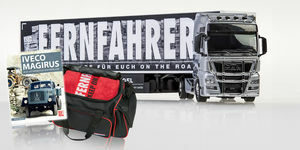 The aerodynamics are also shown to have improved, and the high-roof driver’s cab covers the four-meter-high trailer significantly better than with the older 1844 LS. 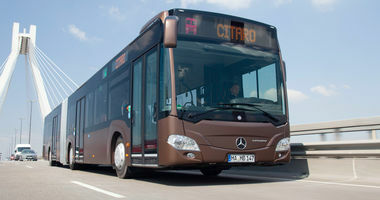 Mercedes states 190 g/kWh as the maximum fuel consumption at the best operating point; the SK was still at 196. All in all, the Actros 1846 does its task almost 3.5 liters more economically in this comparison – and also somewhat faster. The current Actros 1845, which includes all kinds of fuel-saving features, can do it more economically, but not faster. Once again better aerodynamics, an extremely high axle ratio, 200 additional Nm in the highest gear, Predictive Powertrain Control (PPC), automatic shifting with Economy program and much, much more. In short: This Actros 1845 is a product of the time that began with or shortly after the introduction of Euro 6 – the time of conserving diesel. Sure, the consumption with similar transport speed also continuously sank in the years of Euro 1 up to Euro 5, even if only slightly. 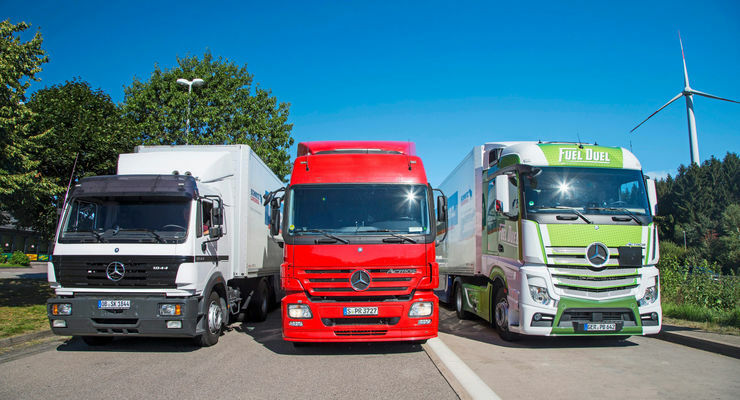 Euro 6, however, will be a turning point in commercial vehicle history, because all truck manufacturers have been putting a great deal of work into addressing consumption since then and using similar methods to do it. The current 1845 uses, in any case, all conceivable means in order to decrease the consumption. One means is also doing without the last bit of speed. It generously gives it away via the PPC, and mostly when leaving an incline, because it knows that it saves a large quantity of diesel if it allows the speed to decrease to 80 km/h or less. In figures: The 1845 proves itself to be very economical with only 31.9 I/100 km, but barely faster than its ancestor, the 1844. This result proves a development that lastauto omnibus has observed over many years during tests and shows that the consumption has continuously gone down since the introduction of Euro 6. And in fact faster than in the previous years. The fact that the transport speed suffers somewhat is surely easy to cope with. Among other reasons, this is because with the current high-torque engines, an average speed of more than 80 km/h is possible even on difficult topography. Much more than 450 hp is not required for this purpose – not even with a full load. Along with many optimizations on the aerodynamics, the engine or the control of auxiliary units, consumption-oriented operation is the ideal solution for lower consumption. The Actros 1845 is factory-programmed, so to speak, for operation of this sort. For example, with Top-Torque, which is the additional 200 Nm that the OM471LA provides in the highest gear. This extra torque considerably increases the driving time in the highest gear – i.e. the direct gear – and at the same time makes an extremely high axle ratio possible in order to keep engine revs as low as possible. The engine is turning at just 1,160 rpm when traveling at 85 km/h. An SK 1844 from 1996 would not be drivable with such a gear ratio. Furthermore, the automatic gearbox is skilled at juggling with the forces of the engine. It knows these forces exactly and moreover knows precisely which gear delivers the best consumption in every situation. The resulting speed is less important – at least in the Eco program, which allows the engine to run at revs between 900 and 1,300 rpm. The revs with the SK 1844 were between 1,300 and 1,700 rpm, in rare cases slightly lower – otherwise, such a veteran can barely be moved. Revs in the Actros 1846 varied in the range of 1,100 to 1,600 rpm. PPC, or Predictive Powertrain Control, acts as the third aid in diesel saving. Thanks to its route knowledge, it prevents counterproductive EcoRoll phases and is furthermore more skilled than any driver at playing virtuously with the vehicle's movement energy. But this still holds: PPC mainly has the consumption in mind; the speed is secondary. All of this also explains why an 1845 hardly travels any faster than the veteran SK 1844, which actually went to work surprisingly quickly. Particularly noteworthy in this comparison was the differing amount of effort for the driver to optimally control the three vehicles over the test route for four days. Especially the SK demanded a high level of concentration and thought. How fast do the revs decline on a hill – do I shift down by half a gear, a whole gear or maybe one and a half gears? The driver is challenged. The 1846 makes it a little bit easier for the driver, because a message appears in the tachometer whenever the revs start becoming uneconomical. The current 1845 is completely different. It automatically drives as economically as possible and does this in darkness or rain and as long as the driver wants it to – and better than the driver could. Along with the enormous economy, that is the biggest strength of today's modern trucks.